In 1969, after seven years of research, Zenith presented El Primero, the first ever integrated automatic chronograph. Beating at the impressive speed of 36,000 vibrations an hour, it delivered excellent performances. 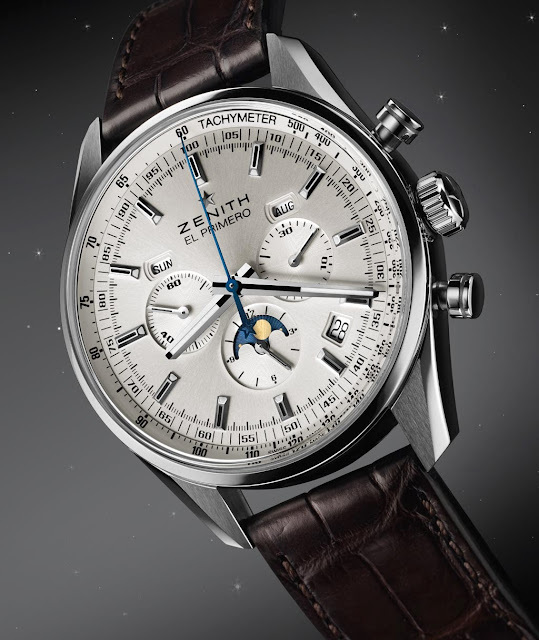 That same year, Zenith pushed the limits even further by equipping the El Primero with triple calendar and moonphase indications. 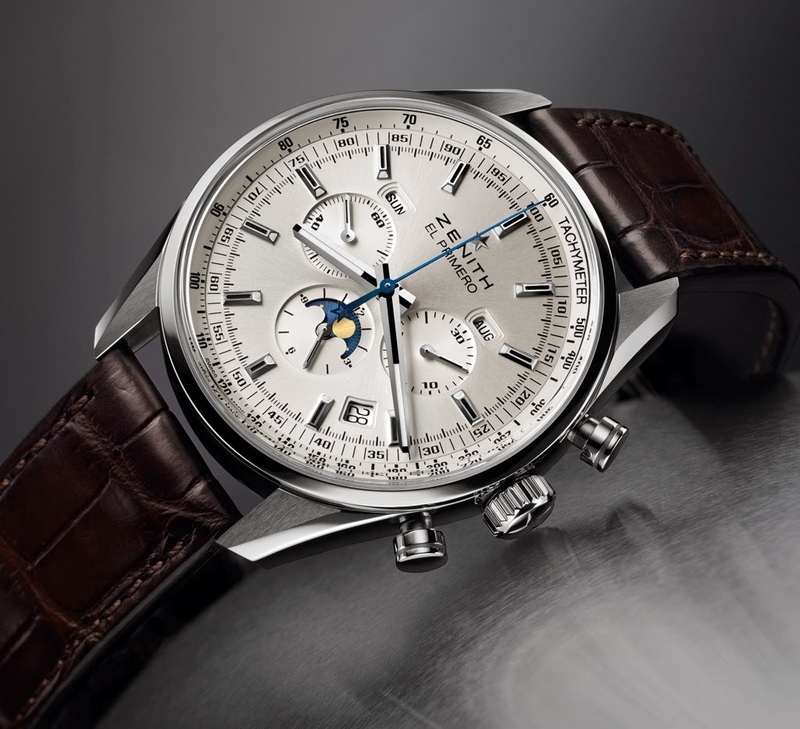 Initially identified as the El Primero 3019 PHF, this column-wheel chronograph movement was later referenced as 410. 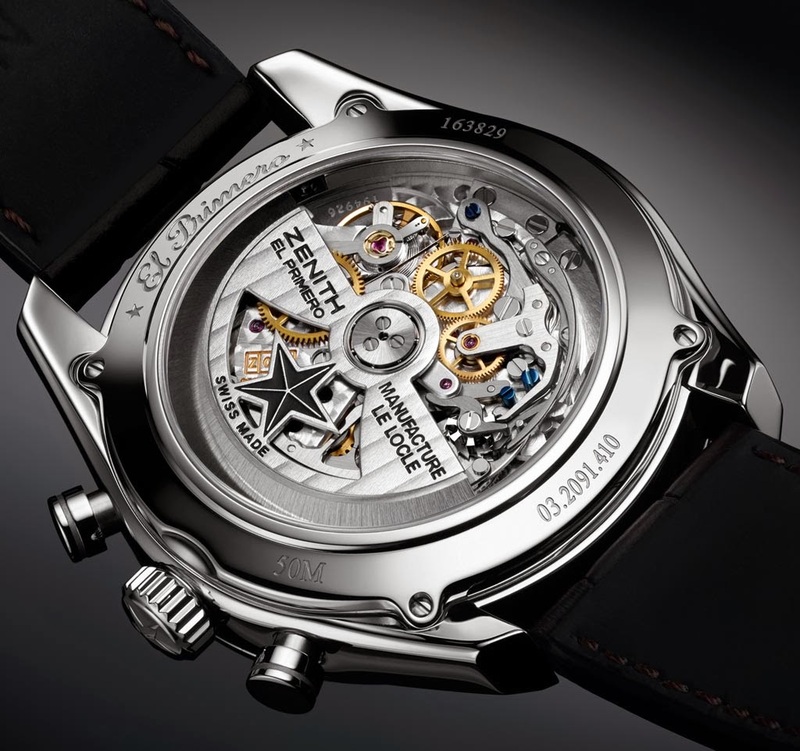 Over the years the Calibre 410 has been used in several Zenith models thanks to undisputed reliability and great precision. 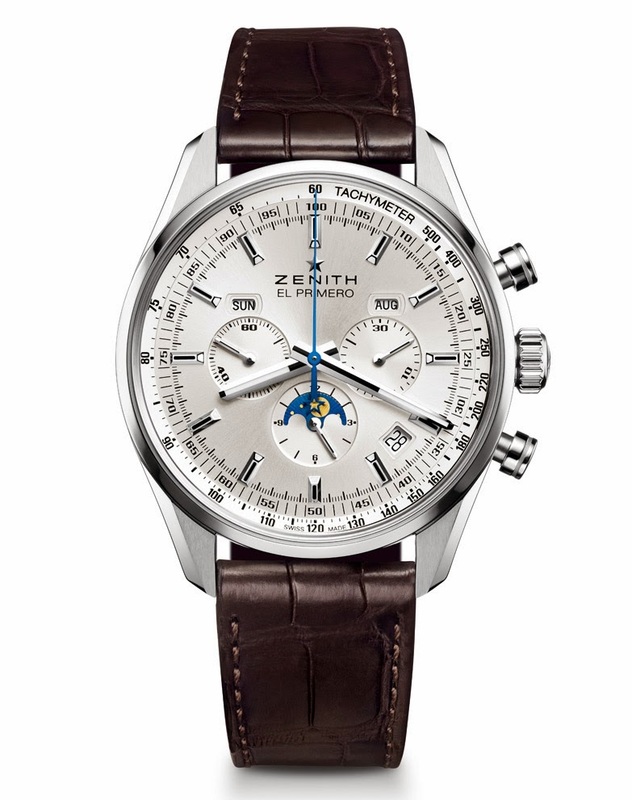 In 2013, Zenith presented a 500-piece limited edition model named after this movement. It featured a slate grey dial with silver sub-dials. 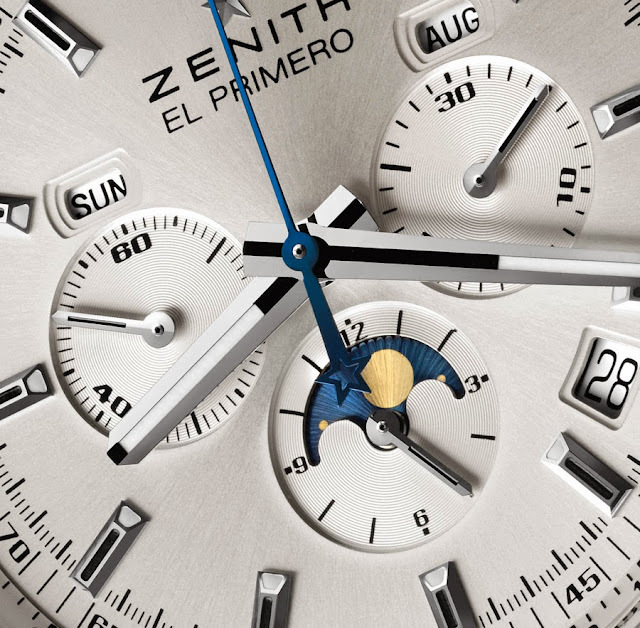 Today Zenith unveils the El Primero 410 with a silver-toned dial which reproduces the original function layout: the days and months are counted off at 10 and 2 o'clock respectively, while the date is positioned between 4 and 5 o’clock. The snailed counters (small seconds at 9 o'clock, 30-minute at 3 o'clock, 12-hour at 6 o'clock) create a nice contrast with the sunray dial motif. 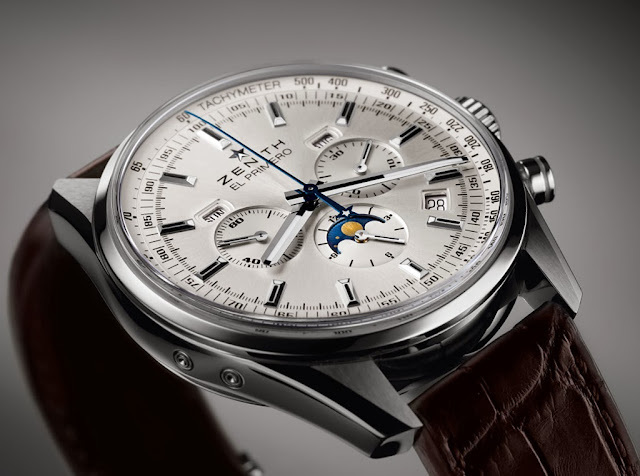 The moonphase indication is merged into the hour subdial at 6 o’clock. The disc bearing two moons is driven by a 59-toothed wheel corresponding to two lunar cycles (2 x 29.5 days). The 42 mm steel case alternates polished and brushed finishes and features round chronograph push pieces. The sapphire crystal case-back displays the real star of this watch, the El Primero Calibre 410 with its 390 components. The oscillating weight is decorated with a “Côtes de Genève” pattern. The Zenith El Primero 410 (reference 03.2091.410/01.C494) offers a power reserve of 50 hours and it is water resistant to 10 ATM. List price is 9500 Swiss Francs.